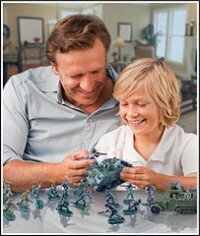 New from Battlefield Legends! Now you can recreate the great battles of the Zulu War with these highly detailed 1:32 scale sets from Call to Arms. 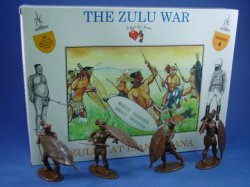 This new Series 4 set of Zulu Warriors at Isandlwana includes 16 figures with attachable shields in 4 poses. This item is shipped to you mint in box. A terrific set of highly sought after figures! Collect the entire set today including Zulus at Rorke's Drift, British Infantry at Rorke's Drift, British Infantry at Isandlwana, American Civil War Union Coloured Infantry, Union Iron Brigade and more.